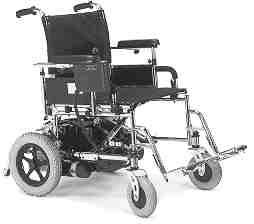 The E-Power - This new, state of the art standard electric wheelchair has many great features! The stylish E-power power chair is designed for great indoor maneuverability yet is completely foldable and portable, unlike most of the power base chairs on the market today. 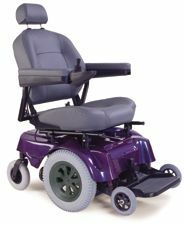 With the rugged, heavy duty casters, auxiliary brakes, incredible 23" turning radius, attractive chrome frame, and very reasonable cost, the E-Power is the standard electric wheelchair of choice for today's savvy consumer! Lightweight and foldable for easy handling storage, and transportation with an amazing 23" turning radius! Seat Width 16", 18" or 20"
Programmable controller with a wide range of selections to suit the needs of many different users. Adjustable height, padded flip-up armrests. Available in 16", 18", or 20" wide seat widths. Swing away foot rests, optional elevating leg rests. Weight Capacity 250 lbs. to 300 lbs. 16" or 18" seat width - 250 lbs. 20" seat width - 300 lbs.